Western Rivers, a leader in the manufacturing of quality game calls designed for day and night sport hunters, introduces their new Stalker 360. The Stalker 360 is the latest, most innovative product in electronic call technology, featuring full remote speaker rotation with 'dual' call capabilities out to 250 yards. Hunters can position each speaker in any rotated direction where they want to emit a specific animal call. 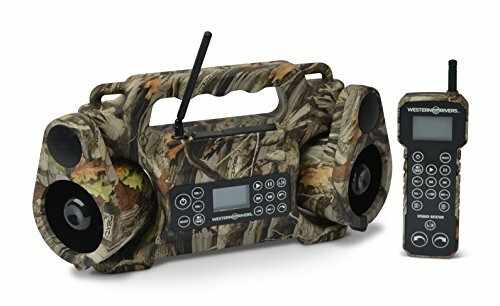 With unique programing capabilities, this 2-channel system allows the hunter to individualize each speaker to release a different call that piques the animal's curiosity to come in closer. The top mounted SD access, USB, output allows users to customize the Stalker 360 with their favourite calls. The Stalker 360 has 2GB of included memory and includes an easy to use menu and sub-menu call navigation by species. For quick use, choose calls from the "Favorites List" that can be created by the hunter. The back lit LCD display screen makes low light and night operation quick and easy to manoeuvre and the rugged weatherproof design keeps you in the field no matter the weather conditions. This call is perfect for avid outdoors men that hunt predator, to those interested in snow geese, crow as well as big game. This feature-packed calling system has peerless volume and sound clarity. If you have any questions about this product by Western Rivers, contact us by completing and submitting the form below. If you are looking for a specif part number, please include it with your message.